Replacement:ROB-12008. 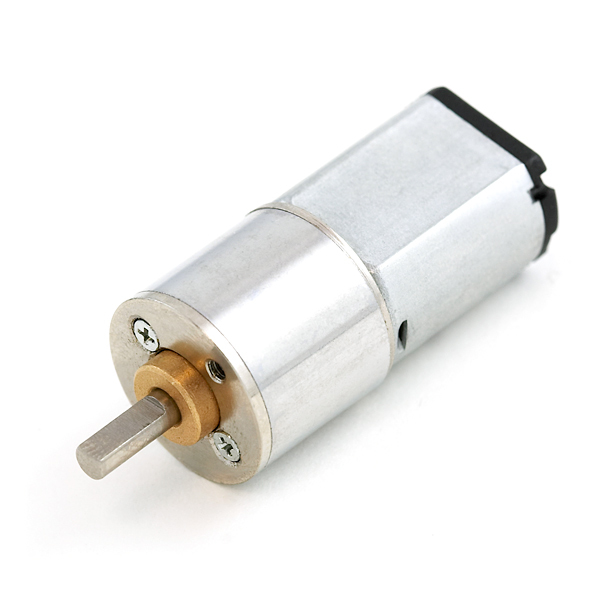 Our new gearmotors have a gear ratio of 105:1 and 152 RPM, go check them out! This page is for reference only. 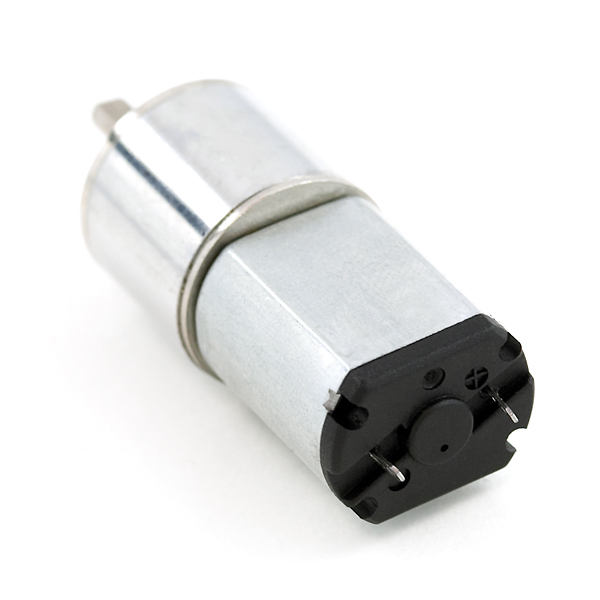 This motor has a 0.275" (7 mm) D-shaped metal output shaft that matches the Pololu wheel 42x19mm and 32x7mm. The face plate has two mounting holes threaded for M2 screws. For anyone who was interested, the torque on this unit (at 6V) comes out to about 0.1059 Nm. Hi, just wondering, why were these retired? You guys still seem to carry the motor mounts for these motors. has anyone tried to calculate the Voltage and Torque constant? It seems that 26 oz inches for torque @6V is not correct. From the datasheet we have Rated Torque = 0.3 kgcm. Since 1 kgcm = 13.9 oz-in then it will be 4.2 oz-in for Rated Torque. You can check it here. Has anyone run one (or more) of these off a single cell 3.7 LiPo? Thanks! If I use 2 of these on the back of a vehicle, how should I mount the front 2 wheels? Where can I buy a shaft that works. the units are in millimeters, right? Does Sparkfun sell the screws that fit the holes on the faceplate? 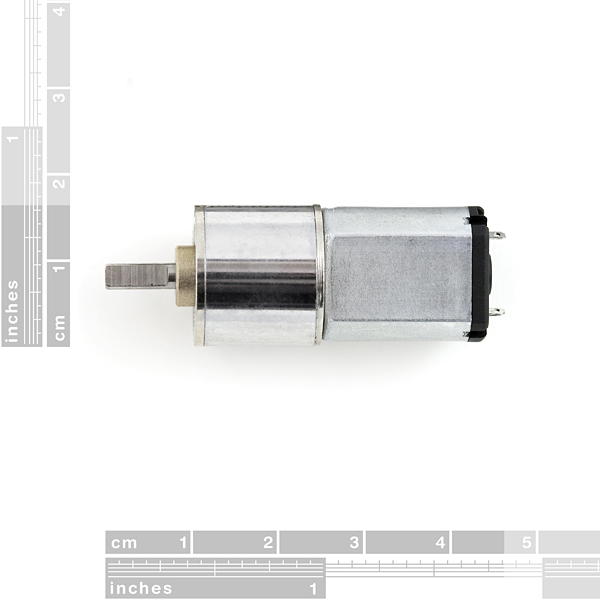 Will the Pololu Wheel Encoder (ROB-09208) fit on this motor? Anyone know if the gearbox on these is plantary or series geared? Could you use this to make a hand crank charger? Does anyone know how much these weigh? Is this compatible with the "Micro Metal Gearmotor Bracket"? No. I believe that bracket is designed to fit the geared motors. Thank you. Are there any other mounting kits that will do the job or do I need to design one? Also, if you look at the drawings, the height on the unit looks to be 12mm, and the width to be 15.5mm, which are only .5mm larger than the brackets... would it fit if it was shaved down? Unless you plan on sending this into space, some hot glue (preferably high temperature) or double sided foam tape should work just fine. Shaving it down may be risky, but it's worth a shot. It's funny that you mention "sending this into space." Would they work in space? Would they work at, say, 90-100,000 feet, by any chance? My guess is the main issue would be temperature extremes, if stuff contracted at different rates it could seize. Datasheet says okay down to -10 C. Though, meh, I bet it's fine. Haha, this will definitely stay on planet earth :P. I'll see what I can do. Thank you. Is the 140 rpm the output rotation or the rotation inside the motor? I believe that the 140rpm is actually output shaft RPM. A few pieces of evidence supporting this are: the Mini Metal 24:1 motor has a higher listed RPM and has the same internal motor connected to a different set of gears. Also, 1.4 RPM is extremely slow and would not support applications in hobby robots (which is what I believe this is target towards). 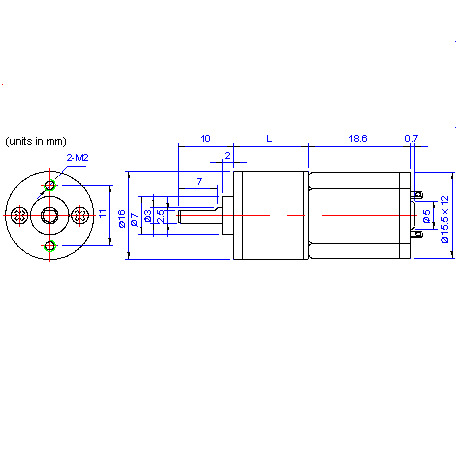 What is the diameter of the output shaft? From what the diagram shows, the output shaft diameter is 3mm round, while the flat is 0.5mm deep.